The #TakeAKnee campaign started by Colin Kaepernick in August 2016 in protest of police brutality against people of colour. He may have found another supporter as a yet-to-be-named San Francisco 49ers cheerleader took a knee during the playing of the U.S. national anthem on Thursday. The #TakeAKnee campaign started by Colin Kaepernick in August 2016 in protest of police brutality against people of colour may have found another supporter. 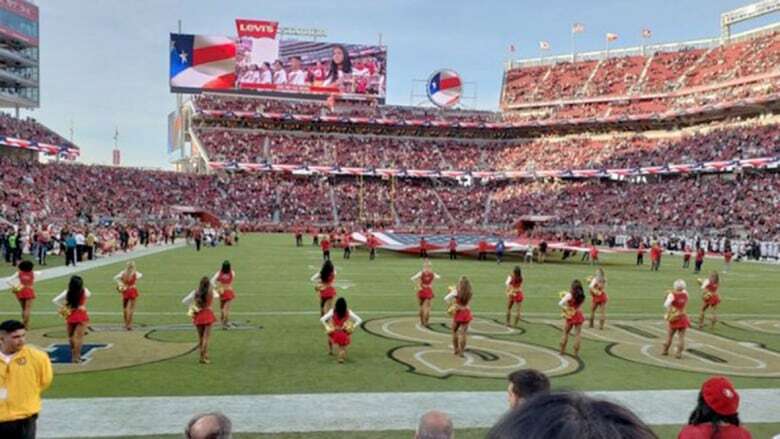 A yet-to-be-named San Francisco 49ers cheerleader took a knee during the playing of the U.S. national anthem prior to the start of the team's game against the Oakland Raiders on Thursday night. Several fans in the stadium pointed out the kneeling woman on social media. The 49ers franchise, as well as the Gold Rush cheerleaders (as they are called) have yet to make a statement on the apparent protest. It's also not yet confirmed if she was kneeling in support of former San Francisco quarterback Kaepernick who gained national attention in August 2016 when he sat during the national anthem. The original reason for his protest was to bring awareness to police brutality. "We have a lot of people that are oppressed," Kaepernick said. "We have a lot of people that aren't treated equally, that aren't given equal opportunities. Police brutality is a huge thing that needs to be addressed. There are a lot of issues that need to be talked about." Kaepernick alleges that his protest lost him his job, and has filed a collusion grievance against the NFL. In an October 2017 article, "This Is Why NFL Cheerleaders Haven't Taken a Knee", one of the reasons given was, "...since cheerleaders are often told how replaceable they are, they felt that they could very easily be fired for taking a stand. One pointed out that even a talented, well-known player like Kaepernick essentially lost his job for making a statement. "Few cheerleaders would be willing to take that risk." It appears one cheerleader was willing to take that risk on Thursday night.